Digital Marketing Weekly - Issue 38 - Facebook Launches Paid Subscription Service! Subscribe Now And Join The Marketing Elite! Each week DMW gives you a quick summary of the biggest and most important news that impacts your business, in the fast moving worlds of Video Marketing, SEO, and Social Media! So get this week's important news by watching the 5-minute video here right now. Prefer to read instead of watching the video? In breaking Social Media news this week, Facebook has announced they will soon begin testing a paid subscription based news service. Traditional news services are struggling to survive in the world of social media and blogs. Facebook has offered a potential solution to provide a business model for professional news agencies. Facebook is taking a huge gamble and will create a ‘paywall’ - which is a digital barrier that blocks access to content. According to Facebook, nonsubscribers will find themselves locked out after they view ten pieces of content. 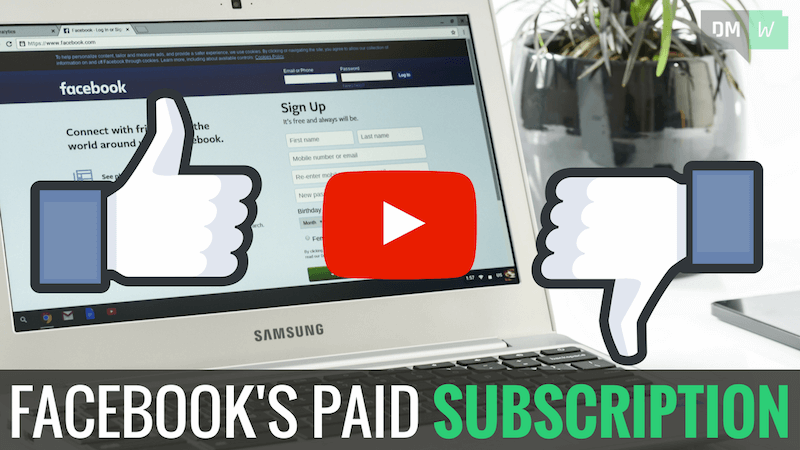 Paid subscriptions will have an enormous impact on the way people consume content on Facebook, so it’s important to keep an eye on how this plays out. Also, if you produce regular news on your blog, such as a video newsletter like DMW, this may be an excellent way to monetize premium content and add another income stream to your business. You can watch a webinar on how to build weekly curated videos like the one you're watching right now by going to www.contentsamurai.com/c/dmw-how-to. For those that don't know, Chrome is the most popular web browser in the world. And soon Google Chrome will identify and flag sites that don’t serve up secure pages. Google Chrome is currently at version 59, and version 62 is when the 'un-secure warnings' are set to appear. This means we’re just a couple of months away, with the rollout expected in October this year! This will have a huge, negative affect on websites that don’t make the change to serve up secure pages. Users who see this warning message may choose to leave your site altogether! Worse yet, this will impact trust when it comes to ecommerce transactions. Your unsecure website may make you look like a scam site, and will scare off potential customers! If you haven’t already done so, make sure your website is configured to serve ALL pages via https. If you don’t, you can expect bad things to happen when the Chrome v62 update rolls out in a few months time. In the past, you had to pay hundreds of dollars for a secure certificate - check out letsencrypt.org for a free and safe alternative. Most video creators publish their content to YouTube and Facebook, but Amazon Video Direct is another fast-growing video platform that should now be on your radar. And the best part is, Amazon is offering a massive bonus to video creators to try and lure them to their platform! The Amazon Video Direct program is free to join and open to anyone. Uploaded video content is available to watch on Amazon Prime, which is a streaming service available on mobiles and media devices. Revenue options for video creators include one-off purchases and ad revenue, similar to that on YouTube. However, the big drawcard to the Amazon Video Direct Program is the $1,000,000 monthly bonus pool, which they divide amongst the top-performing videos every month! Posting your video content to YouTube and Facebook isn’t enough. You should be posting your videos to all of the big players, and Amazon is certainly gearing up to be one of them with their $1,000,000 monthly bonus pool. If you're a producer of premium video content, then you owe it to yourself to enroll in the Amazon Video Direct program and grab your business a first mover advantage. Thanks for taking the time to check out this week's issue of Digital Marketing Weekly! We've put together a quick 4 question survey (Takes about 2 minutes) - Your answers will help us deliver the content that YOU want, so please take a moment to give us your feedback here. P.S. If you missed last week's issue, you can check it out here.